Marion, Iowa. 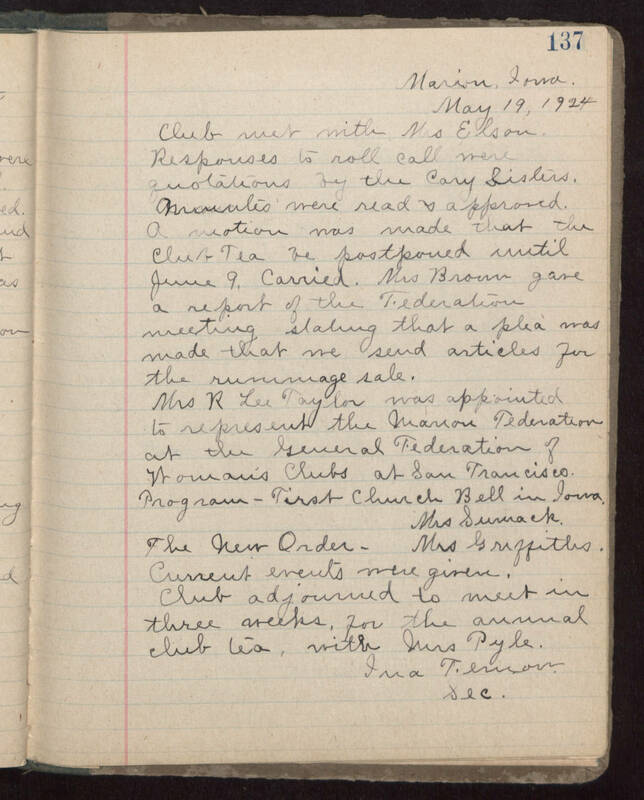 May 19, 1924 Club met with Mrs Elson. Responses to roll call were quotations by the Cary Sisters. Minutes were read and approved. A motion was made that the Club Tea be postponed until June 9 Carried. Mrs Brown gave a report of the Federation meeting stating that a plea was made that we spend articles for the rummage sale. Mrs R Lee Taylor was appointed to represent the Marion Federation at the General Federation of Woman's Clubs at San Francisco. Program - First Church Bell in Iowa Mrs Surmack. The New Order - Mrs Griffiths. Current events were given. Club adjourned to meet in three weeks for the annual club tea with Mrs Pyle. Ima Fernow Sec.